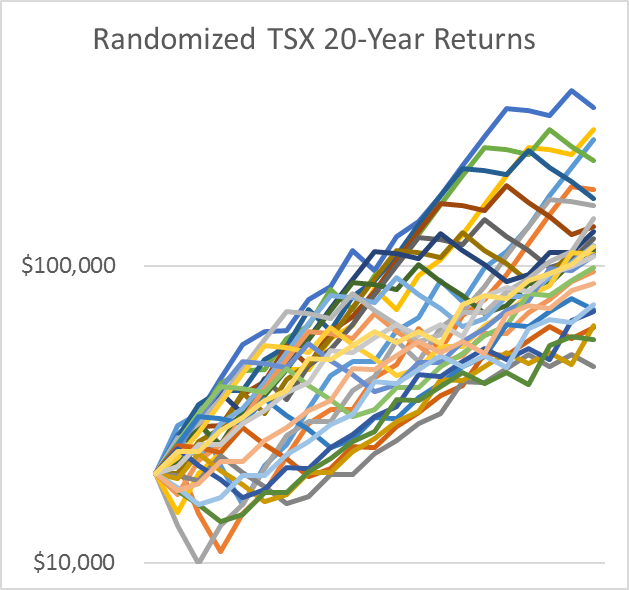 So is there a way of generating more realistic random returns that includes this effect? @Anonymous: I haven't worked out a way I'm satisfied with. One possible approach would be to separately model growth in earnings and market P/E ratio. Another approach would be to use actual returns over longer time periods. For buy-and-hold investors, most dollars remain invested for many years. 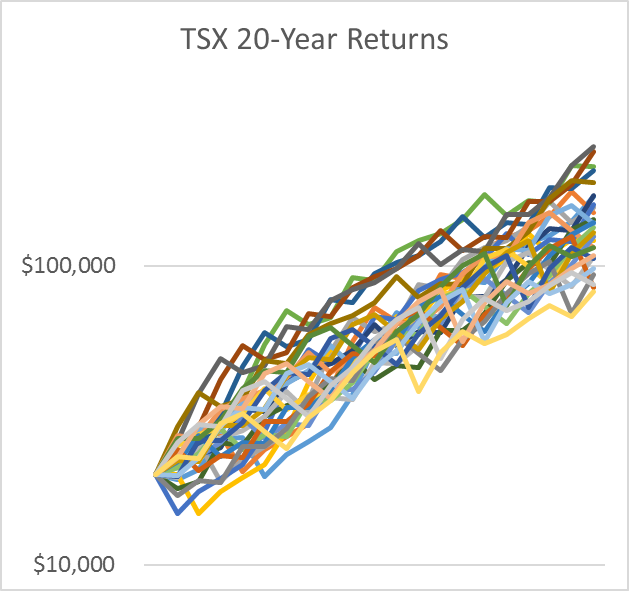 Instead of trying to apply many one-year returns, we could use historical return information to choose a few decade-long returns. All types of models have their limitations, but it's possible to do better than most existing simulators. In the end, though, there is no certainty in life. Use Jim Otars calculator that uses actual returns going back over 100 years. Shows what would have happened to if you retired just before 1929 or 2008 etc. @Thomas: Otar's calculator can give useful results, but the future could easily have outcomes that have never been seen in the past. The simulators I described in this article may give outcomes that are too wild, but Otar's calculator is likely to give outcomes that aren't wild enough. Michael, good post on using Monte Carlo for retirement. What you describe - i.e. using actual market returns - is exactly what Jim Otar has been doing for some time. 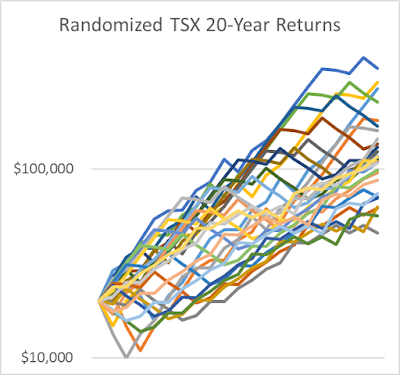 It's an appealing approach because, as you point out, market returns aren't random. One big piece of empirical evidence of this is the momentum effect which has been observed in all kinds of financial asset prices all around the world. If you haven't yet have a look at Otar's work. If I remember his statements correctly, he says that the factor that dominates all others in determining the ultimate success/failure of a withdrawal strategy is: luck. Moshe Milevsky has done some interesting work on this problem too. He came up with something he calls the probability of ruin. And he devised a formula - a much simpler alternative to Monte Carlo - that he claims is at least as accurate. He offered up a spreadsheet with his 'calculator' for some time. A quick search resulted in finding the short calculator but I have both the short and more detailed versions (downloaded years ago). Finally, when I was digging into this topic just about 15 years ago I happened upon a good paper on the appropriate use of MC models and the many weaknesses of using MC in financial planning and related decisions. @Dan: Otar doesn't reorder past returns (as far as I can tell), so his calculator won't have the problem of destroying correlations in time. But his calculator will miss return patterns that have never happened in the past but are possible in the future. The paper you pointed to explains the problems of doing Monte Carlo simulations based on the normal distribution (rather than actual historical returns).